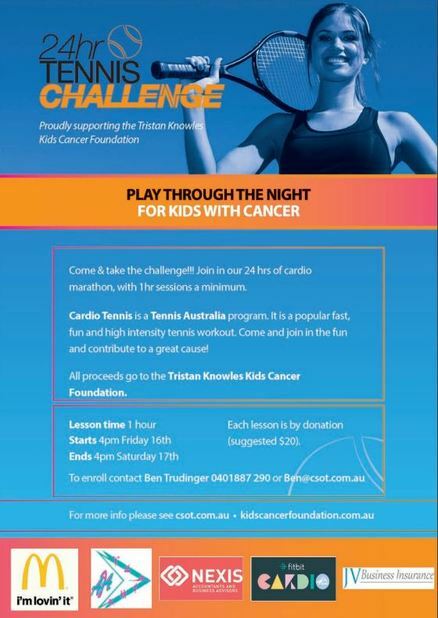 ​Canberra School of Tennis is set to run 24 consecutive cardio tennis sessions throughout the night of September 16 to raise money for the Tristan Knowles Kids Cancer Foundation. The money will go towards providing scholarships for kids with cancer to help them succeed in their post-cancer journey. Now in its second year, The 24 Hour Cardio Challenge will see around 200 members of the public play through the night in a series of cardio tennis sessions. Cardio tennis is one of Tennis Australia’s ﬂagship programs and is a high intensity tennis workout involving a variety of fast paced drills all done to music. The 24 hour Tennis Challenge runs from 4pm on Friday September 16 and will conclude with Weston Creek Tennis Club's annual ‘Tennis Carnivale’ on September the 17th.